Ever since purchasing this house, [Ed] Always wanted a to turn his living room into a home theater, but not just any old projector and a white wall would do. He wanted the whole experience. [Ed] Started with a slightly damaged 12′ wide 4:3 roll up projector screen, he removed the damaged bottom portion and built a static frame to support the now 16:9 screen. Before he could mount the screen, he needed to drywall over a window that was inconveniently located. With the screen now in place, [Ed] framed out the elevated seating platform and steps with some 2×12 topped off with plywood. Next, the carpet that was sitting directly below the platform and steps was removed and then secured on top. Down firing LED fixtures were installed in the steps, to give them that movie theater look and feel. To provide the image, a refurbished HD projector acquired from the Bay of Electronics, was installed in the loft above the living room. With the theater functional, [Ed] turned his attention to theater decorations. Dimmable ambiance lighting fixtures, using laser cut acrylic and CNC routed starboard (a marine-grade polymer), were made to resemble a film strip. Next a coffee table was crafted out of an equipment road case filled with movie props. Studio logos were painted on the sides with the use of laser cut stencils, and with a glass top, gives the illusion it came off the set of a hollywood movie. The addition of a rebuilt movie poster marquee, movie posters, candy stand, pop corn machine, and with the existing soda fountain and the arcade in the loft, the home theater was almost complete. In a fitting tribute, [Ed] designed and built a marquee sign to dedicate and name the theater after his cousin Greg, one of his closest friends and avid movie watcher, who had sadly passed away. Video overview of all the hard work after the break. We’re really starting to enjoy the home entertainment control hacks which use a universal receiver to act on commands from any remote. This one is especially interesting as it uses a single remote to control the system but rolls in lots of extras. Looking at the receiver itself the white plastic dome of the PIR sensor should raise an eyebrow. Since the cable box takes a while to turn on [Ivan] included the motion sensor to switch that component on when you walk into the room. This way it’ll be ready to go by the time you sit down. It does this by sending IR signals from the PIC32 dev board. Of course the board has its own receiver to listen for the remote control commands. The remote buttons have been mapped a bit differently than originally intended. You can see in the diagram above that the normal VCR/DVD/DVR buttons have been set to control the room’s LED strips. There’s even a power consumption monitor rolled into the project. All of these features are demonstrated in the clip after the break. This is a nearly perfect base setup. But we’d love to see it with a web interface at some point in the future. To make the most out of his home theater sound system [Baccula] built this folded horn enclosure for as much bass sound as possible. The design was conceived by [Bill Fitzmaurice] who thought there needed to be a better way to use the subwoofers which are typically used in home systems. His design is called the Tuba HT and it is aimed at a 15″ speaker. [Bill] charges for the building plans, but we don’t mind living vicariously through [Baccula’s] construction album. As you can see, there are a lot of wood parts that went into the cabinet. It starts with a base of 2×4 framing. From there the plywood sawdust really starts to fly as each component is produced. During assembly [Baccula] is careful to fully glue each joint — you don’t want to find out that your sub cabinet vibrates after you get everything installed. All together the new piece of living room furniture stands three feet tall and deep and two feet wide. The album has no captions but you can read a bit more about the project in the Reddit comments. Using IR repeaters for larger home theater setups is not uncommon, but they usually are quite simple. A series of IR receivers are placed throughout a home, all wired to repeat the signals in a central closet where all of the AV equipment is located. [Bill] constructed a solution that works much like a standard IR repeater setup, however his requires no receivers, and it can be used anywhere in the world, provided you have Internet access. 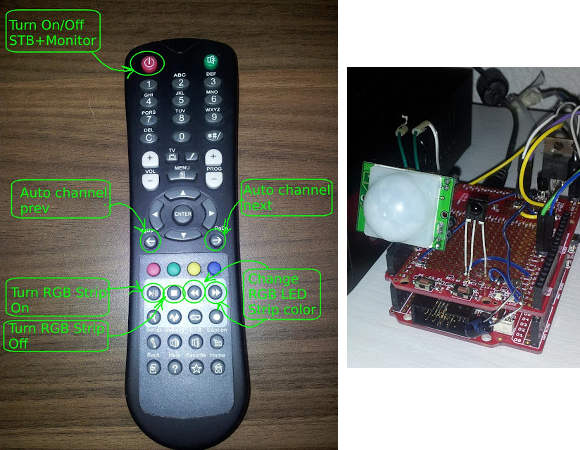 His project, called Ether IR, is an Internet-enabled IR repeater. 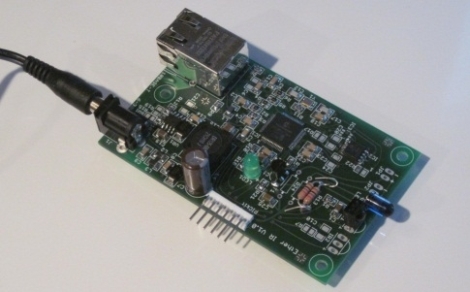 It consists of an Ethernet-connected module with an IR LED mounted on it, capable of controlling your AV equipment. The board is hooked up to your LAN, and relays commands to your home theater via a simple web page. The equipment can then be controlled from any Internet-connected device, such as a mobile phone or tablet PC. The entire project is open-source, so [Bill] has included schematics, instructions, and a bill of materials so that you can construct your own. The only issue at this point is the software portion of the project. The software is free, but the distribution method is in question – once things are sorted out, he will ensure that you can obtain the software for your Either-IR from him or directly from the Ethernet chip’s manufacturer. [David] took some interesting steps to put together his own Slingbox-ish setup. 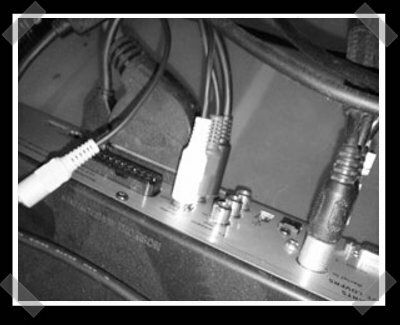 He used a Mac mini running Quicktime Broadcaster to capture the stream from a Firewire video camera which his cable/satellite receiver is plugged into. You’ll have to use an OS X machine, but that’s not too difficult these days. Broadcaster is about the simplest way to capture from Firewire and stream. We’re using it in our own office to multicast the signal from a Canadian satellite box. Projectors have long been a favorite toy of hardware hackers. From reactive displays to cheap home theater, there are plenty of reasons to play with photons. Seeing some cheap projector repair put us in the mood to cover some of our favorite projector projects – check em out after the break.